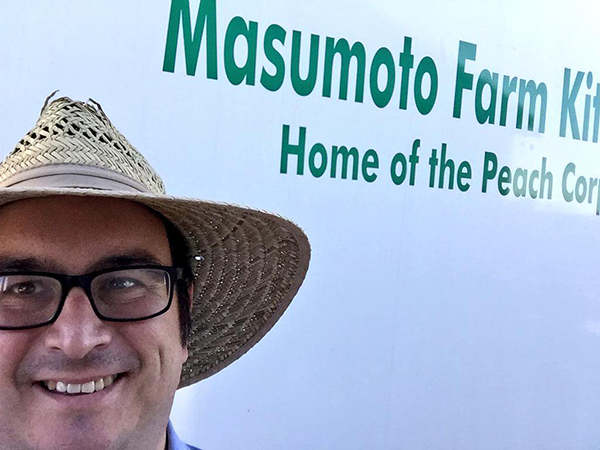 I am happy to announce that I am the inaugural Masumoto Family Fellowship recipient, for 2017-18. To mark the public announcement of the fellowship, I had a great conversation with agrarian artist (and my dear friend) Nikiko Masumoto on Oct. 30, 2017. Nikiko: What was your first introduction to the Masumotos? Jefferson: My first introduction to the Masumoto family, I actually remember very clearly. I was still working at The Fresno Bee at the time. It was probably 2001 or 2002, and I saw you and your dad perform out there at UU church. It was you and your dad and Larry Honda. You were taiko drumming and your dad was reading poetry and Larry was playing a trumpet or saxophone… and I went with my friend Carrie Higa, who used to work at The Bee as a copy editor. I don’t know if she knew your dad or was just a fan of his writing like me, but we went together. I had read Mas’s stuff in the paper, but that was really the first time I was taken by your family, watching you and your dad perform. And all I did was go and watch, I didn’t speak to you or anything, but that was my first introduction to your family’s energy and creativity. My introduction to the farm was through Tracy, my wife. She volunteered at the peach adoption, I think 5 years ago. But even before then, your dad came to one of my graduate writing workshops at Fresno State, maybe around 2006, and he made me and the whole class eat dirt. To taste the flavors. I’ve told you that story before, right? I don’t know if you want me to tell it again. But he came to that grad workshop, and then I was so flattered the next spring, when he came out to see me and my friend Eric Parker read our work at the Rogue Festival. I was so moved because, you know, he’s Mas Masumoto! I’ve been reading him for years, so for your dad to come out and see me and Eric perform was a real honor. That’s how I struck up a friendship with him. N: Now, I know that you grew up in the Valley, but for everybody else, tell us a bit about where you grew up and, what do you treasure most about this place? J: I grew up in Dinuba, which is in northeastern Tulare County. Specifically, we grew up in the country kind of out by Monson, which is a little town between Dinuba and Visalia. We grew up on my grandfather’s ranch. I went to Monson-Sultana School, a tiny little K-8 school on Mountain View Way, between Dinuba and Orosi. I think on my website it says something like, “I grew up in the heart of Tulare County raisin vineyards.” Our house was called the “old home place” because that’s where my grandma and grandpa lived years ago, with my mom and my aunts and uncles as kids. So then we rented it years later from my grandpa. We were surrounded by agriculture. We had plums to our west; they were Freedom variety plums, remember those? The speckley ones. The fruit in the back were the heirloom O’Henry variety peaches. J: And then we had some Thompson raisin grapes in the back too, and some Gala apples just to the north and east of us. That was our immediate area, and then there were dairies all around, owned by other people. So yeah, I grew up on that ranch and I lived with my parents there through my first four years of college at Fresno State too. So maybe, about 20 years of my life I lived just outside of Dinuba. N: Do your folks still live out there? J: No, they do not. Since 2002, they’ve lived in Dinuba now, “in town.” People don’t understand that distinction, in town or not in town. N: Yeah, totally. We have our “in town” clothes. J: Exactly, they’ve lived “in town” now, for a while. So, you also asked what I cherish about that place. I started working with the family maybe when I was about 9 or 10. We had a packing shed. My grandfather’s family came to the Dinuba/Reedley area as a migrant. My grandmother was born in the Hanford area. There was a landowner named Malcolm Crawford from Dinuba who my grandpa Joe worked as a ranch hand for. Malcolm died young and I guess on his deathbed, he asked my grandfather to help care for his widow, Ruby Lee, and care for his acreage, and in return he would give my grandfather acreage to start for his own. So by the time my aunts and uncles came up, he was the landowner – my grandfather! He had worked hard and saved. So by the time my generation came up, the family owned a packing shed on the outskirts of Dinuba. I feel like we might have been one of the few Mexican-American packing shed operators in Dinuba and Reedley? So I started working at age 9 or 10, in the packing shed. We had like 100 people working for us just in the shed. Plus more in the fields. J: It was a good-sized operation, totally mechanized. So my first job for the packing shed was putting pads in the boxes. Hundreds of boxes would come and I would put the pad in, close the lid, and send them on to the sealer. Me and my cousin Steven, we would alternate days, so he would work Monday, Wednesday, Friday and I would work Tuesday, Thursday, Saturday. So you know, $1 an hour. J: That’s a big deal. Because, you know, when you are in the 5th grade and you make like $30 a week, every week for the whole summer, you’re a big man on campus. J: Yeah, you’re like hey, juice boxes for everybody! Many years later, one summer I helped run the packing shed as the foreman. So, to circle back to the question about what do you cherish. You know, I think it’s the ground. Like, literally the ground. Somebody said to me once, “You are in the Valley and the Valley is in you.” And I always think about that. I am the ground. Now, I’m very far removed from being a farmer of course, but I grew up around that and that’s what my reality was. Education separated me from that, for better or for worse. But that was my reality for years. I worked every summer in the packing shed, for 7 or 8 years growing up. “You are in the Valley and the Valley is in you.” That’s why I always have these joyful flashbacks when I’m handling the Pantas [the thin plastic trays used to pack fruit in] on the Masumoto farm. N: You have all those embodied memories. J: Absolutely! It’s absolutely tangible. You know, that sound the crinkle of the Pantas makes when you’re stuffing them down, that’s a very physical memory for me. N: This is a question that brings us more into the contemporary, and it will be interesting to hear if there is resonance with your past. I’m curious, Jefferson, what words do you like to use to describe yourself and your work? Like, creator, artist, journalist, organizer, amplifier, or a totally abstract word? What do you like? I think I’m a writer. I do also like to make photos. I do like sound. I’ve been learning more lately about video. I’m a terrible video editor but I’m a pretty good shooter. So, I guess multimedia writer or multimedia storyteller is probably as close as it’s going to get to something succinct. In my current work at Fresno State, I’m a communication specialist for the Creative Writing Program. This means that I’m telling the stories of the program that I work for. I’m also Development Director for Fresno Filmworks, which means I’m involved in developing relationships and fundraising. “Arts administrator” is another broad term, I guess, because I do event planning and budget and project management. So maybe we’re getting to something like: arts communicator, writer, multimedia storyteller. Somewhere in there? N: One of the words I wrote down that kind of came to me is: amplifier. N: I see a lot of your work as amplifying stories, whether through Fresno State or Filmworks or elsewhere. J: I appreciate that encouragement. I would also maybe add documenting to the amplifying. You and I have talked about this before. Sometimes, I think just being present is really important. Just pressing record at some of these things, poetry readings and performances, it’s so essential. We’re surrounded by media, and media is in our pockets, but sometimes we don’t think to just record it. N: What are some of the contexts or conditions that allow your creativity to flourish? J: For my ideal conditions, I need more quiet. I tend to present myself as very outgoing and type-A, but I think I’m more of a high-functioning introvert. So, I think that I’ve discovered that I need and want a lot more quiet in order to make things. But, I also think that we get caught up in the notion of the “ideal moment” to make something or do something or start a project. I have to say, I’m really tired of that. I feel like I’ve been holding myself back on that for years, and I feel like we have the tools in our pockets to tell stories and to document, so why not just do it. The last year and a half or so, especially since the current political shift in Washington, I’ve just decided to stop waiting. And my work is not perfect. But I feel like, we can’t wait to make things, to make art or words or really anything creative. My ideal place is a place that’s quiet, where I have time to think. But I also have another mode where, I don’t know what this is going to be, but I feel compelled to make it now, because if I don’t, then I know it’s not going to get made. N: What are the creative works you are most proud of? J: The reason that I got my MFA at Fresno State was to write a book, my thesis manuscript. I’m not going to publish that book; it’s not a publishable book. But I was grateful I got 4 years in graduate school to write my book of essays. I’m really proud of that. I think that 4 of the 8 essays were published, and one of them was a Pushcart Prize nominee, and that was great. It was a really formative moment for me, thinking of myself not only as a journalist, but thinking of myself as a writer and creator. So, I’m really proud of that book, even though it only sits on my own shelf. In terms of public creative output, and I’m not saying this just to flatter you, but the investment and the belief in me that you showed in my photography project, 100 Days, 100 Portraits, still means a lot to me. It has been popping up in my Facebook memories because it’s the anniversary from a couple years ago, and I’m really blown away still, that I performed that as part of your Central Valley Art Bus Tour, and then all 100 photos up in San Francisco at a big-time exhibition with dozens of artists from across the state who I’m still in touch with on Facebook, and all because of your invitation. But that was something I just did for myself at the time, and then it became something else, which is a great lesson, right? Do it for yourself. I’m proud of that. I think most people don’t know that I really enjoy photography. That project really showed me that simple portraits of people and who they are and what they do have value and they have meaning. It had meaning for me in the exploration. That was good enough. Right now, the project I’m most proud of, I’m actually not “doing it,” but I’m facilitating it. It’s the Fresno Poets Archive Project. We have 80 tapes of the very earliest Fresno Poets’ Association readings from the ’80s and ’90s. I’m facilitating undergraduate interns who are researching, captioning, and in as many cases as possible, reconnecting with the people in those tapes from 25-plus years ago. And they are really stunning documents of literary history in the Valley. I’ve been taking extensive notes as we go along, in conversations with the students who are working on them and in our research together. I might write a book about the process at some point. There’s 80 tapes and we’re publishing one a month. So, it’ll take about 7 or 8 years to publish them all at this rate! Unless I figure out a way to speed it up somehow. But I’m really proud of that right now because I feel a lot of pride for being a writer from Fresno. But I also feel – similar to some of the stuff you and Brynn Saito are doing with the Yonsei Memory Project – it’s an intergenerational thing. This is where you come from, these are the people who came before you, and these are the amazing things they did. These are people that, to me, were just names in a book before, people I’ve read my whole life. And now I’m hearing them, literally. I’m hearing their voices for the first time, and it’s transformative for me. Transformative. I’m doing it a little for myself, but I think a lot of people are plugging into the recordings. So I’m proud of that. N: Tell us about what you’ve purchased for yourself with the funding from the Masumoto Fellowship! J: With the Masumoto money, I completely simplified my audio/video recording set-up. I bought what’s called an iOgrapher. It’s basically a big hunk of plastic that your iPhone clicks into. It has a place to mount it to a tripod, it has a place to mount an external shotgun microphone, it has a place to mount a LED fill light, and it has handles to hold it and use it like a steady-cam if you’re off-tripod. I went to a training session recently at CMAC TV in downtown Fresno. That’s the Community Media Access Collaborative, where I’m a member. We did a training on iOS production and they had iOgrapher kits with iPads. It’s everything you need in one box, and that made it all feel so easy and inspiring. So, the funding from the fellowship didn’t quite give me enough to buy the whole box, but that turned out fine because I actually kind of wanted certain pieces that didn’t come with the main kit. So basically, I bought about 3/4 of the kit with my first installment of the fellowship funds. This includes the iOgrapher gadget, an external light, a shotgun mic, a couple plugs and cables, and a backup battery charging pack for the whole operation. I’m using my existing iPhone and I can set it up in a minute! All I need is my tripod, screw it on and it’s done. It’s so easy! People have really noticed it in action, too. N: Anything else you’d like to add? J: I’m so grateful that the family would think of me for the fellowship. I know you all know a lot of writers and artists, so I’m very flattered, like beyond flattered that you would believe in me that much. I’m honored. N: We are so happy and can’t wait to see what we make!